Skiing Binds Friends Together; Don’t Skip A Trip. One of the great things about the sport of skiing is that it is a conduit for friendships. There is nothing like the anticipation of the weekly get together with friends or the ski trip with pals that you have skied with for over 40 years. There’s a buzz: the excitement, the snow reports, who has new equipment, and when and where will we all meet. The guys that I ski with every year on a March ski trip go hard. 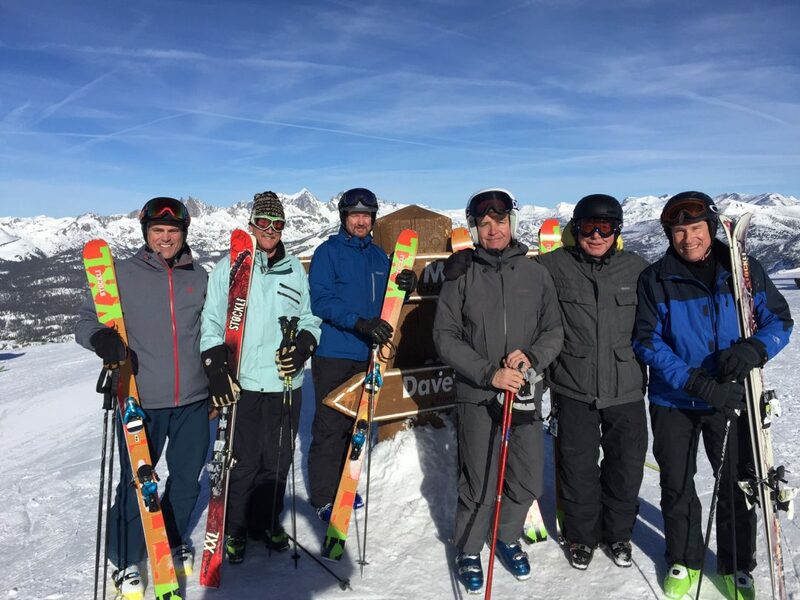 They are ex-ski racers and coaches and keep themselves in good shape and we all look forward to the annual trip together coming in to Tahoe from all over the country. They are cherished friends, and we lost one this summer to an unexpected heart attack. Proctor Reid was a Dartmouth ski racer back in the day and a highly educated head of a government engineering think tank in DC. Proctor always impressed me with his big strong GS turns as well as his intellect, and great sense of humor. It will be a hole for sure in our group this coming March as we toast and ski a run or two for our pal Proctor. He is pictured on the right in the blue and black jacket with all of us at the top of Mammoth with the great backdrop of the Minarets. God bless him. We miss him terribly. Another guy in this group pictured in the back with the blue jacket is our ring leader and host Eric Durfee from Incline Village, NV. He recently cut short a trek in Nepal with his wife because of an unfortunate accident. While spreading the ashes of his in-law at the base camp at Everest, he blacked out and fell eight feet into rocks off the side of the trail. He was helicoptered to Kathmandu where he and his wife spent a week during extensive tests to determine when and if he could fly home. Fortunately, everything checked out, and they are on their way back to the states flying first class to Reno from Kathmandu. He tells us all not to worry. He will be skiing Mammoth next week. Tough old bugger. Not being morose here and hoping to spark a little thought, life is precious. There are no guarantees and that is why it is so important to get together with friends and no better way than on a ski trip. Sure, things come up and there are always a million excuses for why we are too busy, it is a bad time, had a flat tire, or some other lame excuse. But when you make it a priority, skiing binds you all together for memories that last a lifetime. Same with the groups at your local areas. Yes, it is cold, the weather might not be optimal here in the East, but drag yourself out and be held accountable to your local group and expect the same results of laughs, great turns together and that cold IPA at the end of the day in the ski lodge. Treasure your friends. Go ski with them. And always remember—no friends on a powder day. I concur wholehardedly. My wife and I ski on several trips each winter with college friends of 50 years, usually to NH & Vt. As a friend once said, it’s better to be looking down at the grass than looking up. Ed from upstate NY. Your comment brought a smile to my face Ed…I have a friend I have been skiing with for about 30 years and every season he looks down from the chairlift and makes that comment…”better looking down than up.” smile, we are both in our 80’s. I am also in my 80s and love skiing. Have you done skiing ⛷ in Hakuba Japan? 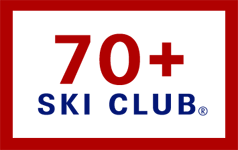 How can I join a ski club? I organized a ski group back in the late 80’s. It started with 4 of us and increased to as many as 15 regulars from all over the U.S. We named ourselves “The Marauders” and meet for 10 days in SLC just prior to Spring break to ski eight different mountains. 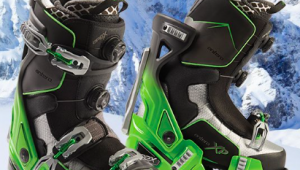 Time has taken its toll with several skiers passing on or experiencing physical difficulties.. I treasure the friendships!!!!! Well said Pat….I’ll be on the hill tomorrow. “there’s no ski racks on coffins”. Great Message Pat! See you on the slopes soon!